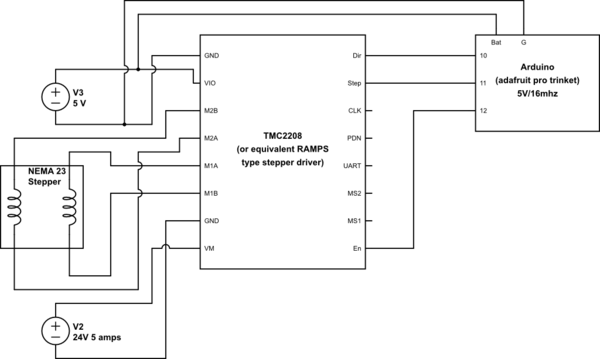 Hi, this is a question that is related to the use of the TMC2208 silentstepstick and similar stepper drivers. When I apply 24v to the VM/ground pins, the driver chip gets fried. This happens regardless of whether I have an arduino connected to the step/dir pins or the enable pin grounded. This also happens regardless of where there is 5v going to the VIO pin or regardless of whether the stepper motor is connected. This motor power supply is a 24v dc unit rated at 5 amps. The actual chip itself gets fried as soon as the VM pin sees 24v. It feels like it is just instantly drawing a huge amount of current as soon as it's connected regardless of whatever else is connected. I tried a similar setup with a DRV8802 and the same thing happens. I have used these many times for different applications, 3d printers and other things and I have never had this problem. Any ideas? I have posted at stackexchange with a schematic which I will attach here. Thanks so much for any help. Maybe you plugged the driver in the wrong way round? Or, if you had to solder the header pin strips on yourself, maybe you soldered them on the wrong side of the board? Hint: on some types of driver, the chip is on the underside of the board when it is plugged in. Edited 1 time(s). Last edit at 10/23/2017 03:48AM by dc42.